You guys!! How is it already the second week of December?! Am I the only one who feels like this month is flying by? Christmas will be here before you know it & if you’ve been following us on Instagram you know we’ve been hard at work getting the Dreamhouse all snazzied up for Christmas. Our tree is up & I’ve been working on a few quick & easy crafts to add to our festive decor. I’m all about crafts that are simple & don’t take up too much time so I thought I’d share this one that literally took me 10 minutes and cost next to nothing – our DIY ornament string garland. Start by gathering an assortment of your favourite ornaments. I opted for miniature bulbs & tiny shaped ornaments because the scale of them worked for where I was planning to hang them but you can use any you you like. Feel free to use whatever extras you have on hand – remember – easy & inexpensive is the goal here. I scored these adorable miniature ornaments on clearance at Michaels & Loblaws/Real Canadian Superstore. Quick tip – if you’re like me & often save things until the last minute, once we get into December, most stores start to discount all of their Christmas ornaments. Or if you like to plan ahead, everything goes on clearance right after the holidays so it’s easy to find great deals for the following year. 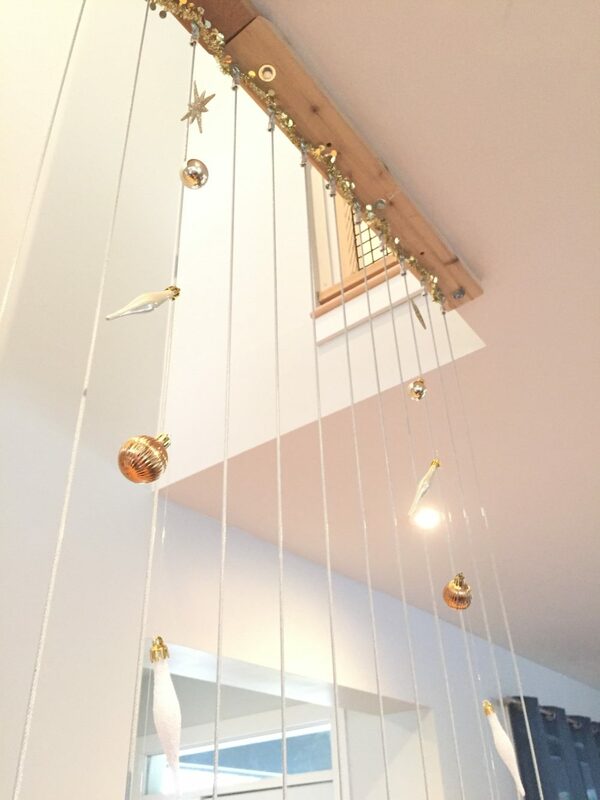 Measure the height (or length) of the area you’re looking to hang the garland. In our case I was planning to hang the strings vertically from the ceiling almost to the floor, but these would look just as fabulous horizontally thrown over a large leaning mirror or hung from the front of a mantle. Once you have your length (in our case it was 8′ or 96″) cut your fishing line to size leaving a bit extra to allow for tying at the ends – about 6″. If you’re making more than one garland (because one is never enough am I right? 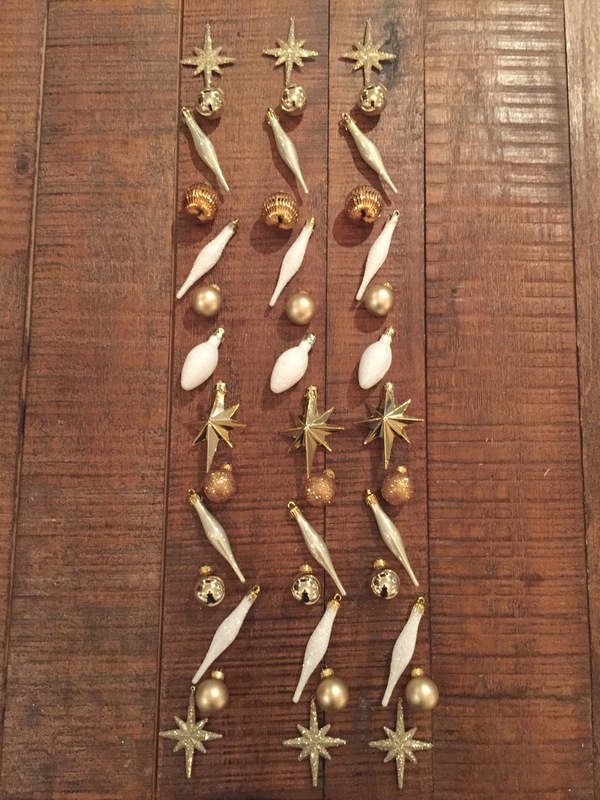 ), divide your ornaments evenly so that each string has the same amount. If you’re going for a random look you can move on to deciding spacing, but I’m a sucker for a good pattern so I layed all my ornaments out to decide the order I’ll attach them which will keep things symmetrical. 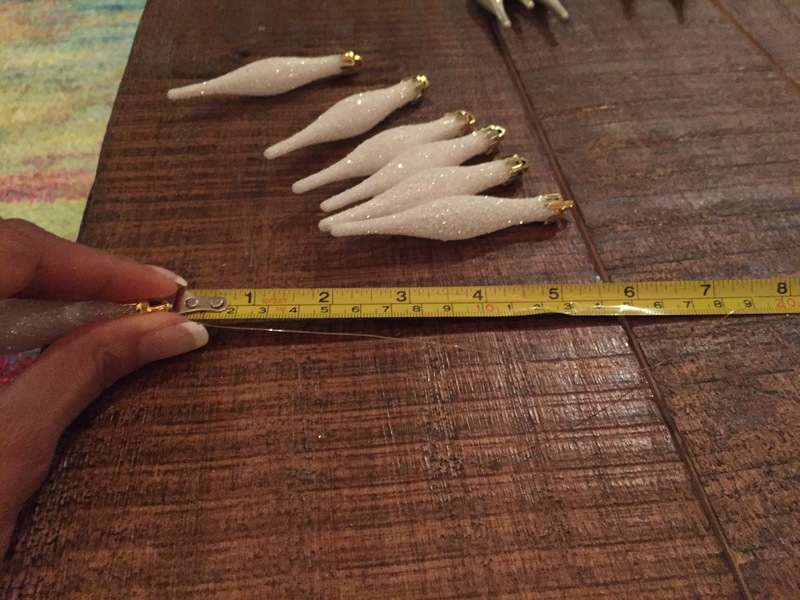 I then started by measuring 18″ on my line & tying my first ornament there. 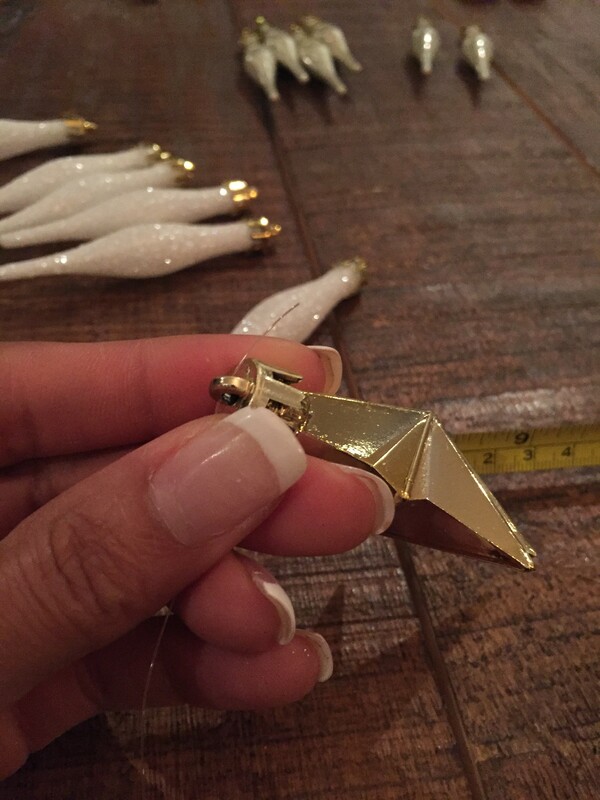 Measure 6″ from the spot where your first ornament is tied and tie your next ornament on there. Tip – Mark your measurement spot by making a crimp in the fishing line using your fingernail and squeeze it using your fingertips. 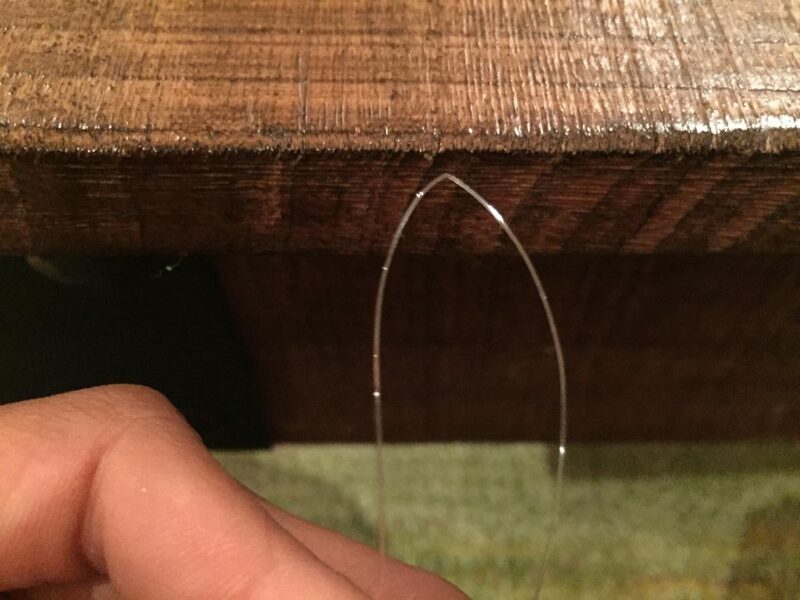 This will help you find your spot easily when stringing on the next ornament. 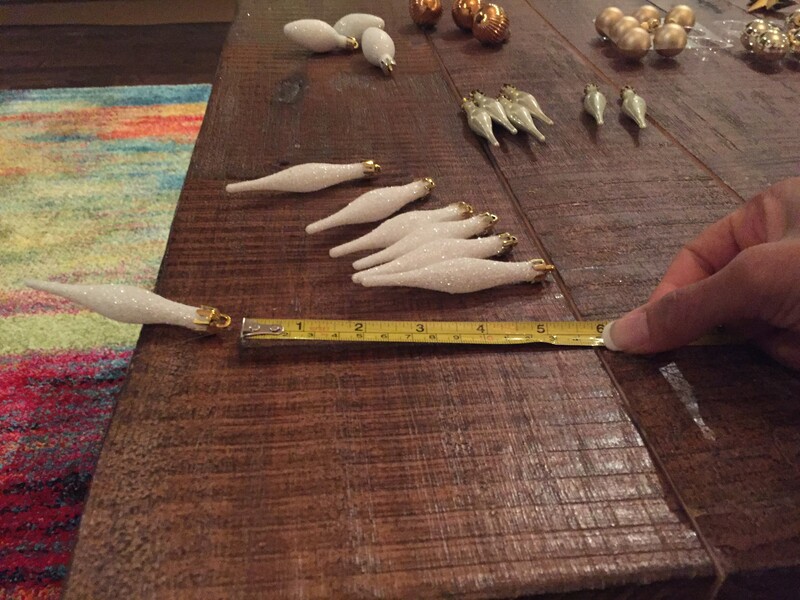 Repeat the process of measuring and tying the ornaments to the fishing line until all ornaments are attached. Use your Command Decorating clips to hang your garland by tying the end of the fishing line to the clip hood & securing the clip to your hanging surface. 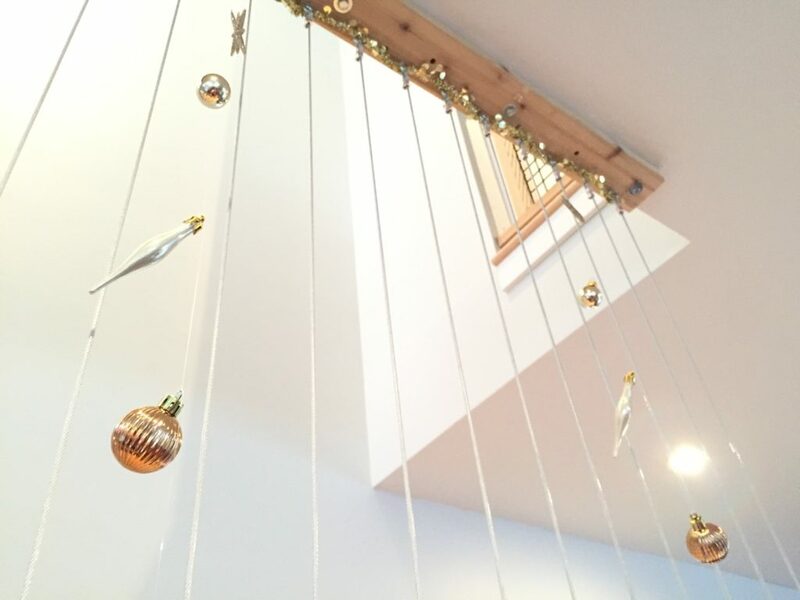 And there you have it – your DIY ornament string garland. Enjoy all the sparkly goodness! Disclosure: This post contains affiliate links. By purchasing through our links, you are directly supporting our blog and the businesses that help us make the Dreamhouse possible. So thank you! Wow! 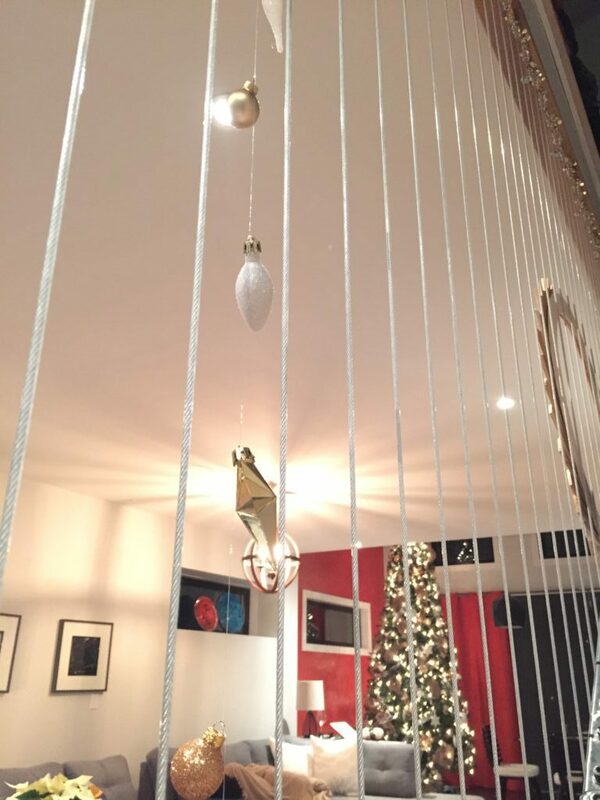 never would have thought of stringing decorations there….so creative. Can’t wait to see them. I really like the way the vertical drop of the ornaments co-ordinates with the vertical wires of the stair railings! 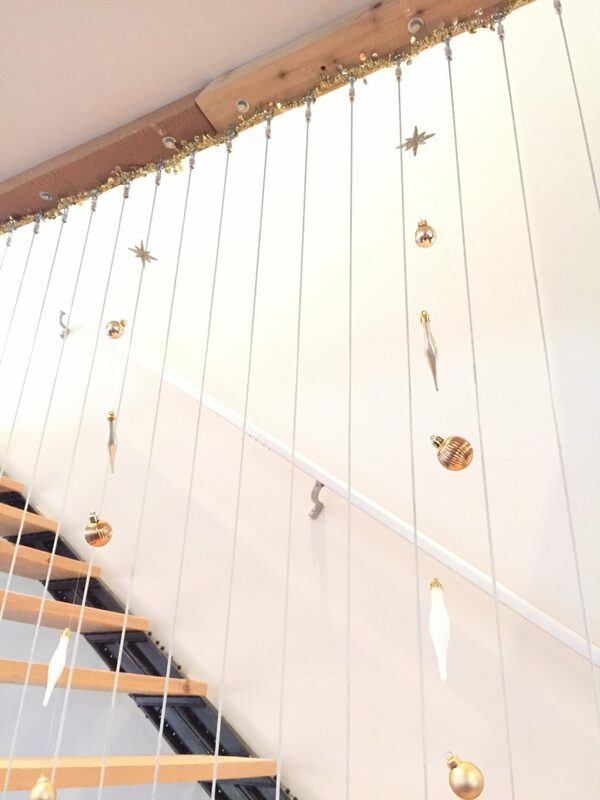 Do you need any kind of weight at the end to keep the fishing line hanging down straight or are the ornaments enough on their own? Thanks Kathleen! Nope. No weight necessary. 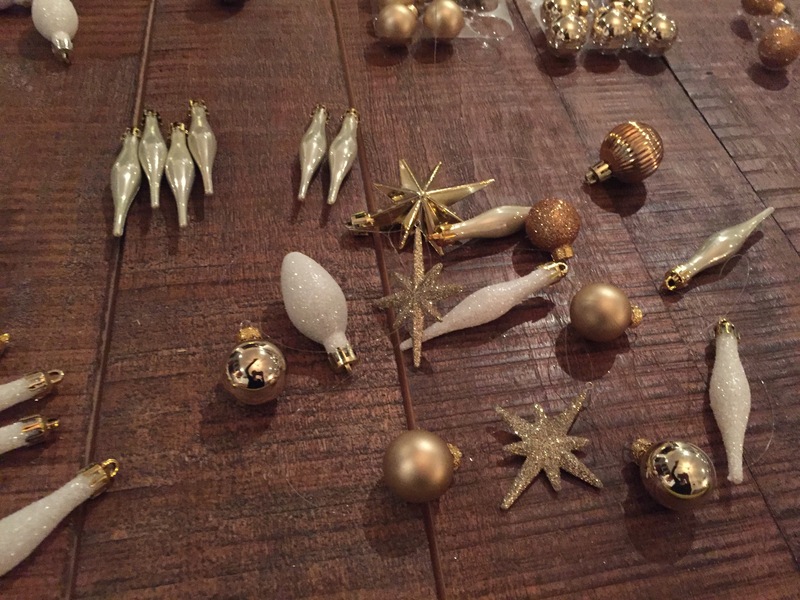 The ornaments are all you need. ? Thanks for stopping by! I absolutely LOVE that your Mom commented, adorable! I love this idea, such impact and so simple, except for the death defying heights – haha so jealous of your high gorgeous ceilings! 😉 I loved your quick tip too… I am a last minute kinda girl! Haha, thanks Laurie! She always comments. She’s one of our biggest a supporters. Also was probably the first to read our little blog. ? I’m TOTALLY a last minute girl. I haven’t even finished my list yet, let alone Christmas shopping. ? LOVE this!! What a simple, but elegant idea! Your home is beautiful, thanks for sharing!